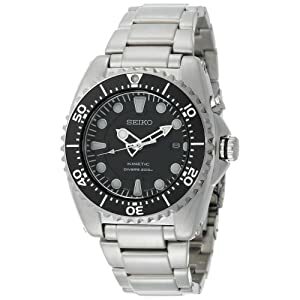 This is a very attractive dive watch, but it's also rugged and fully functional. It features a stainless steel bracelet and case that are silver-toned. The bezel is also stainless steel, but it is black. The large hands and hour markers make this watch easy to read. The bezel rotates in one direction only - a standard feature for dive watches. It is water resistant to 200 meters (660 feet), so it can go deeper than most divers will. It's a kinetic watch, so it gets wound by arm movements and doesn't require a battery. This watch has a nice fit and finish, and is pretty hefty. A great gift for a man who wants a bulky, manly watch.